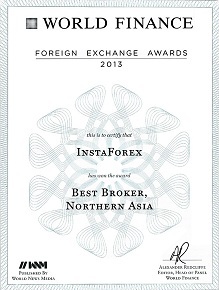 Being an international broker, InstaForex has been honoured with numerous prestigious awards in the sphere of finance. The representatives of the company regularly take part in thematic exhibitions and other events devoted to the issues of the currency and equities markets development. The partners of InstaForex are entitled to refer to the presented on this page certificates to warrant the top quality of services, reliability and high business reputation of the company. 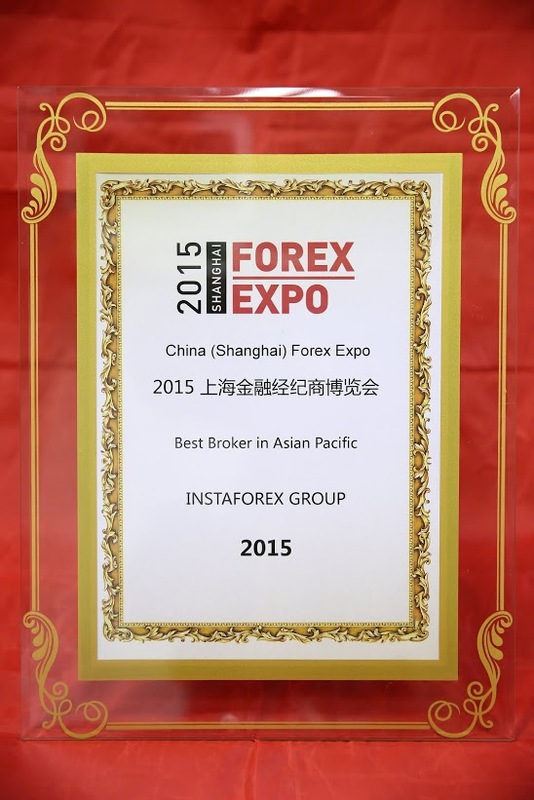 In the spring of 2015, InstaForex was presented the Best Broker Asia 2015 Award by reliable online news recourse CFI. According to the qualified judge panel, who gave InstaForex such an honorary prize, the company is an absolute leader in the market of high-quality trading services and products needed for being successful on Forex. CFI is an established online news resource reporting on business, economics and finance. In addition to news coverage broadening, the journal created its own Awards Program which is assumed to be among the most prestigious in the financial world of today. 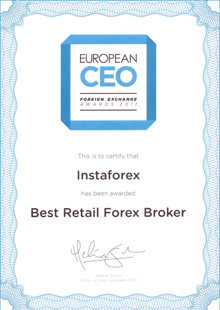 The fact that the broker won such a top-level award reveals that experts recognize the highest quality of services and products by InstaForex. That proves company’s right choice of priorities in development and client-oriented policy. Shanghai Forex Expo 2015 is one of the most prestige events in the financial industry. Traders, retail and institutional investors, brokerage companies and their partners traditionally take part in the exposition. 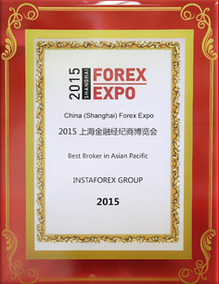 At Shanghai Forex Expo 2015, InstaForex was honored in the category of The Best Broker Asia Pacific 2015. Expert recognition of the company’s flawless performance proves that InstaForex is a reliable partner for thousands of clients from Asian countries. 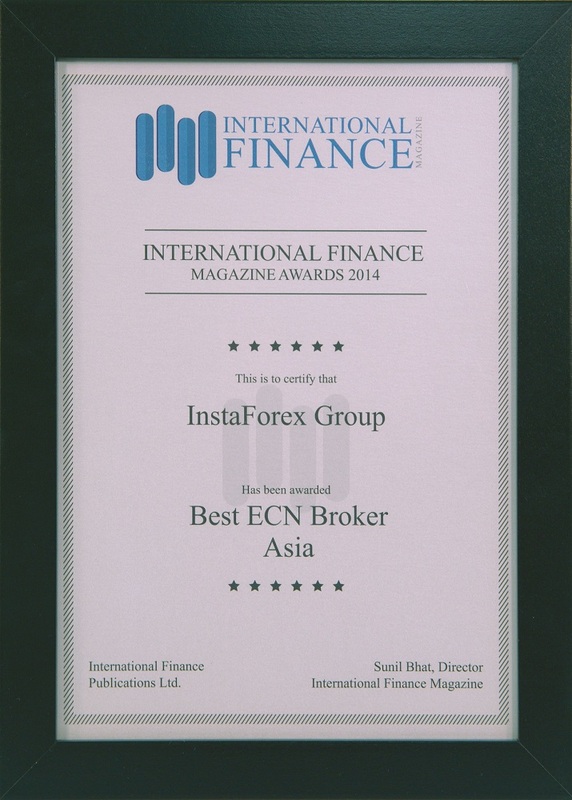 UK-based International Finance Magazine has awarded InstaForex the title of Best ECN Broker in Asia 2014. The award was presented on November 18, 2014 in London. It is the second one given by IFM which proves the broker’s status as a reliable partner on Asian financial markets. Thousands of traders from Singapore, Malaysia, Thailand, Indonesia, and other countries in the Asia-Pacific region opt for InstaForex. The fact of winning the IFM Awards, designed to honour achievement in the international finance, is a milestone in the company’s history. 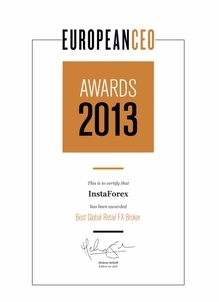 London-based edition European CEO has awarded InstaForex the Best Global Retail FX Broker 2013 in the framework of its annual European CEO Awards. 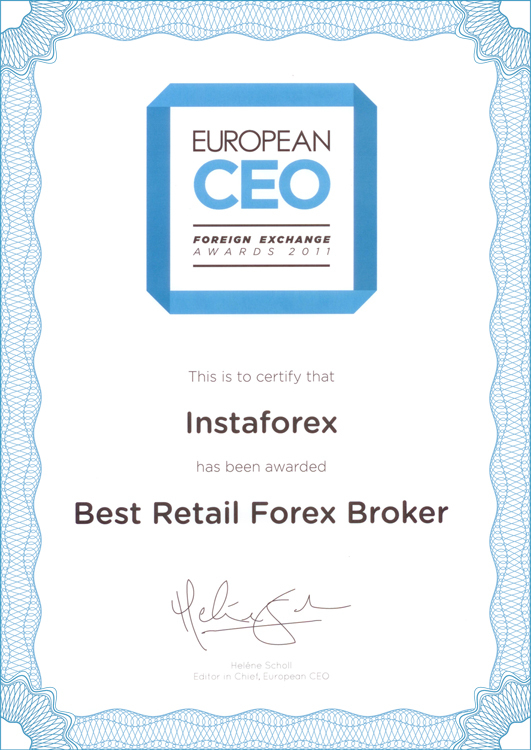 The award certificate is yet more proof that InstaForex has chosen the right path for achieving this privileged position in the international arena. It is worth noting that European CEO certificate is the second one for InstaForex in the last three years. 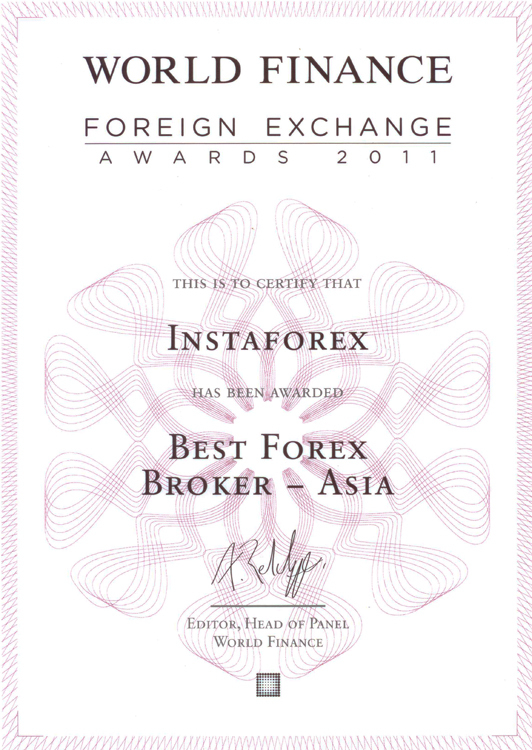 In 2011 the British magazine also named InstaForex the best retail broker. European CEO Awards recognize financial industry leaders across more than 20 categories. It is held once a year and said to be one of the most reputable and reliable awards. Today, European CEO is a premier edition devoted to major businesses. European CEO reaches an audience of more than 100,000 online and print readers every month. InstaForex was recognized as the Best Broker in Northern Asia by the UK-based financial magazine World Finance at its World Finance Awards held in London. It is the fourth year in a row InstaForex has been receiving awards. This fact proves the leading position of the broker in Asia and contributes to its credibility. InstaForex has been considered Asia a strategic region, thus reaping 50 representative offices with the largest affiliate network. Moreover, the broker’s official website is translated into the languages of all Asian countries where the company is present. World Finance is a leading-edge edition highly rated by the business world. Dozens of big-name journalists, distinguished analysts, and invited experts from major companies in Europe and North America work for the magazine. 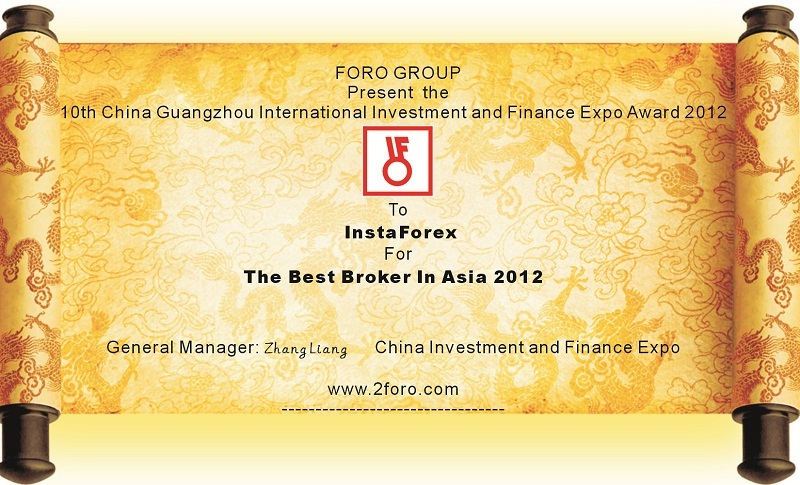 InstaForex was awarded the title of the Best Broker in Asia 2012 at the 10th China Guangzhou International Investment and Finance Expo, held March 5-7, 2013. 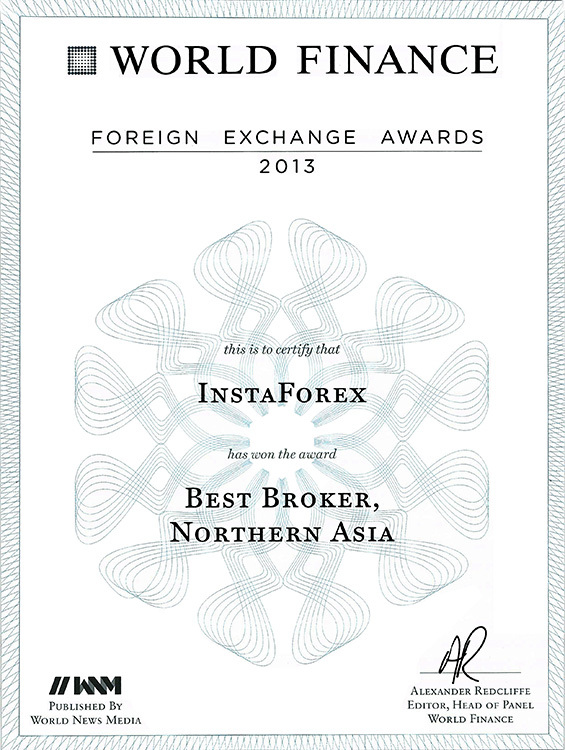 Having high quality of customer support, innovative technologies, and up-to-date services, InstaForex has many times been recognized as the top-notch Forex market participant. The International Investment and Finance Expo took place at one of the world’s largest exhibitions and was one of the most anticipated business events of the year. Tens of investment companies from all over the globe and 50,000 visitors were involved in the event. 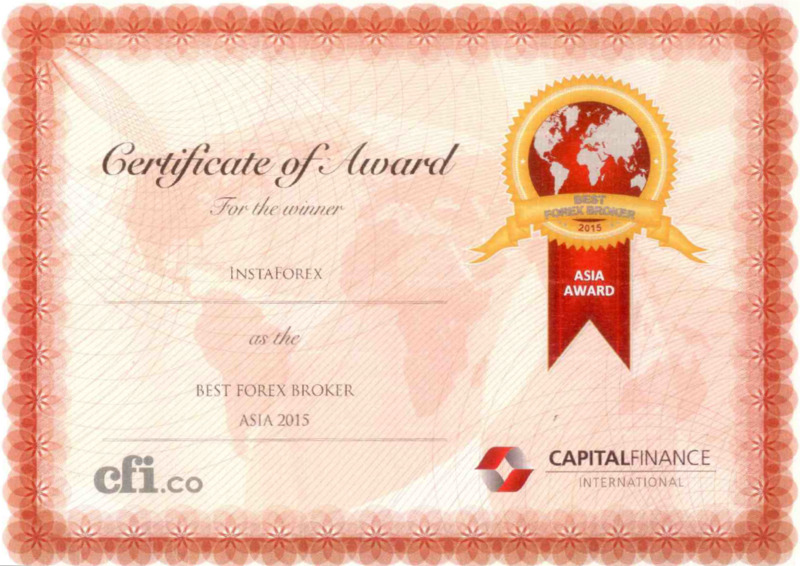 InstaForex was awarded the Best Broker in Asia 2012 certificate and it is the remarkable event. It proves that the company’s policy is rightly aimed at cooperation with clients and partners. 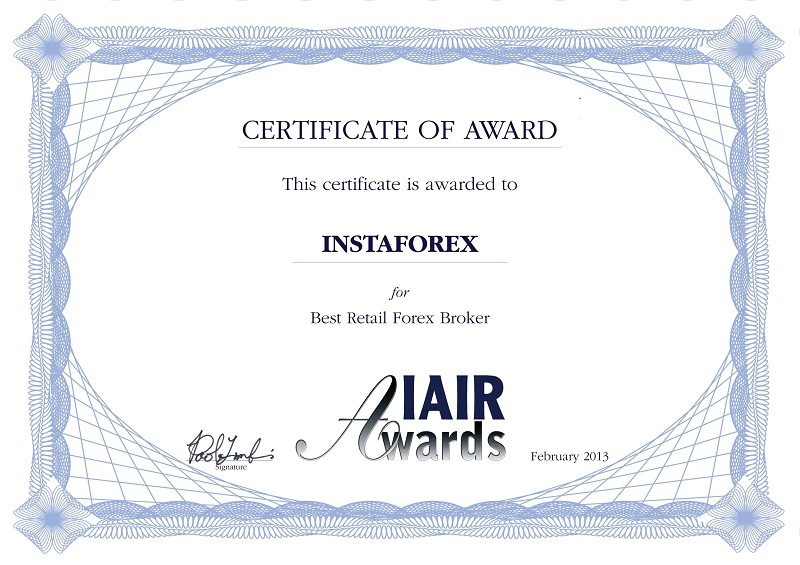 InstaForex was recognized as The Best Forex Broker for 2012 by IAIR Awards in early 2013. 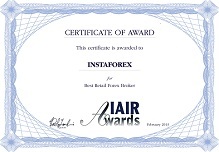 Apart from the award, made of cast glass with lettering, InstaForex was granted an official certificate acknowledging IAIR Awards receiving in The Best Retail Forex Broker category. The certificate obtained in Milan is of great importance for InstaForex. Above all, it is the first company's award in 2013. 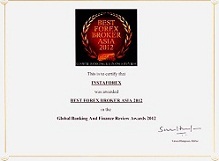 Besides, InstaForex was highly commended by the independent and competent jury for rendering top-notch services. InstaForex extends its appreciation to company's supporters as well IAIR Awards organizers and, undoubtedly, numerous customers whose loyalty was instrumental for certificate and award receiving. InstaForex, in its turn, will make every effort to meet all modern market requirements and continue evolving in response to customers' needs. 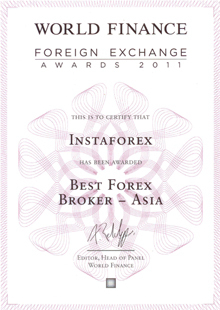 In 2011, the British magazine World Finance named InstaForex the Best Broker in Asia. The InstaForex leadership in Asia is grounded on comfortable trading conditions, special offers, a wide network of offices, a unique beauty contest Miss Insta Asia etc. This award is a confirmation of the fact that the strategy chosen for the Asian region has proven effective. World Finance is a reliable business magazine focusing on capital markets, risk management, trading, state-of-the-art technologies, corporate management and other economic issues. Every year the magazine holds the prestigious World Finance Awards where all top financial companies of the world are summoned. 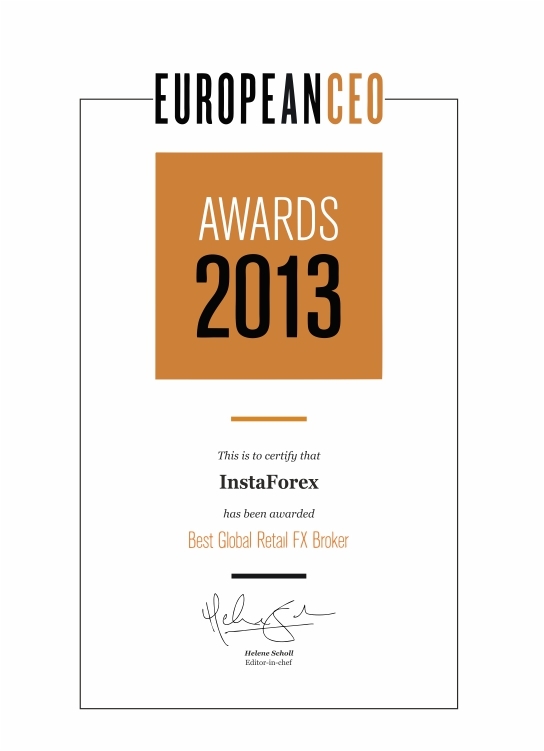 EUROPEAN CEO, an authoritative London magazine, honoured InstaForex with the Best Retail Broker 2011 title. This certificate is additional proof that InstaForex is constantly upgrading the level of private investors’ (customers’) service and employs a flexible approach to individual task solution. Working with InstaForex on financial markets, a trader whatever his experience may be is free to choose the most convenient tools and build an optimum investment strategy. With InstaForex, your opportunities are boundless! EUROPEAN CEO is a VIP magazine providing its readers with up-to-date information essential for taking professional management decisions: news, statistics, detailed analytical reviews, interviews with authorities and CEOs of large corporations. 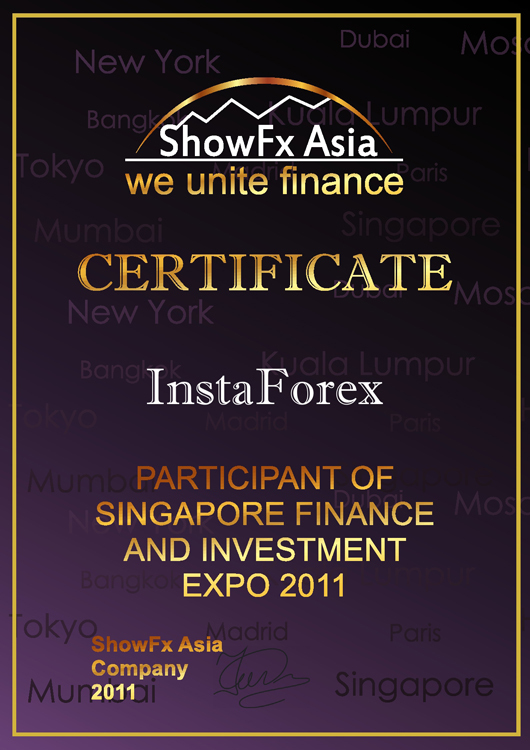 ShowFx certificates verify the company’s participation in the international financial exhibitions. An exhibition is a great chance to meet representatives of various companies, clients as well as partners. InstaForex managers inform traders about the services of the company, ask them for comments and new ideas, and adopt experience and business ideas of partners. Furthermore, an exhibition provides an excellent opportunity to establish contacts with consumers and estimate competitiveness in the industry. 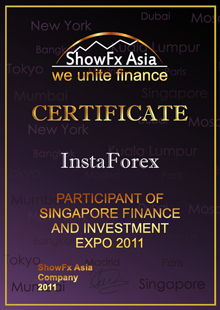 ShowFx international exhibition brand is involved in organizing diverse events devoted to the Forex market functioning. The target of this project is the development of Forex industry establishing communication between market participants and users of brokerage services. 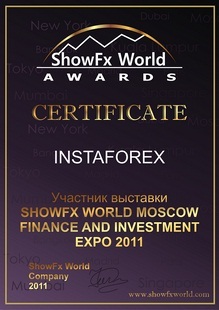 This document certifies that InstaForex took part in the ShowFx World exhibition held in Moscow in November 2011. 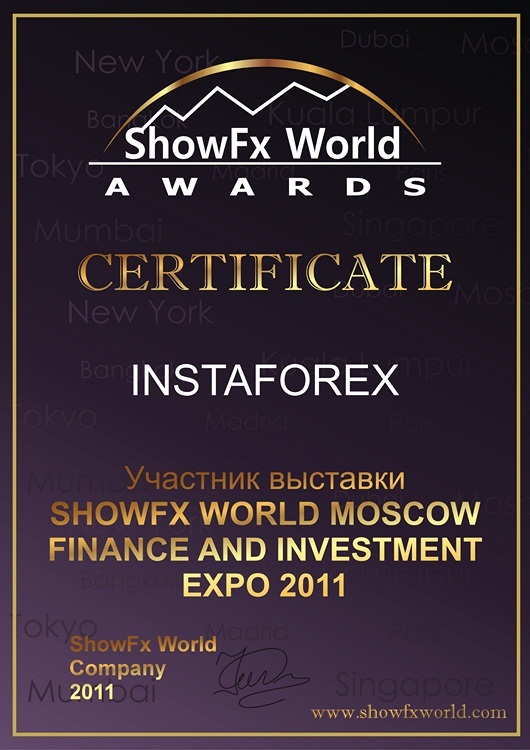 Moscow Finance and Investment Expo 2011 was a landmark event for InstaForex — the Company was recognized by the ShowFx World organizers as the most rapidly developing company providing state-of–the-art trading services and contributing to the development of its field of activity. 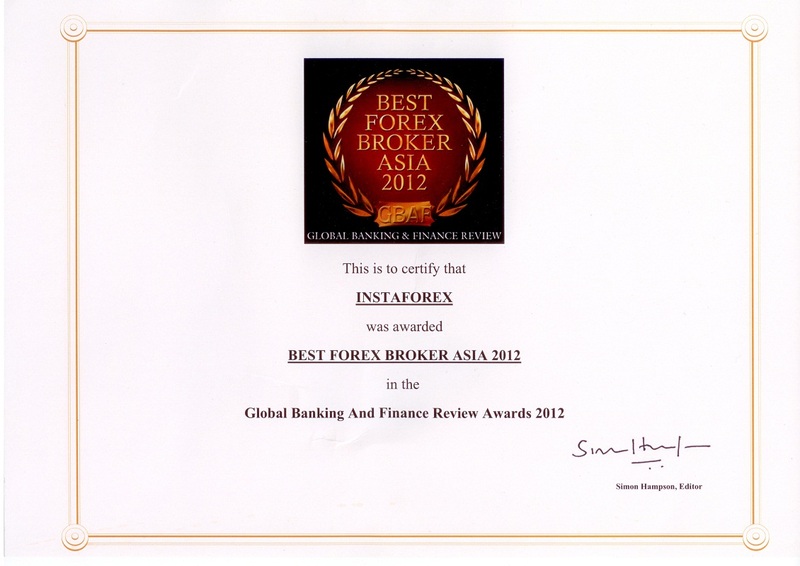 In March 2012, Global Banking & Finance Review awarded InstaForex as the Best Forex Broker in Asia 2012. Global Banking & Finance Review is one of the largest European web portals devoted to the analysis of financial markets. The Best Forex Broker in Asia 2012 certificate is a result of research conducted by the respectable and independent portal jury, which includes world’s best financial experts. The Best Forex Broker in Asia title is supplementary evidence that InstaForex Company provides the most beneficial and convenient trading conditions for online Forex trading. The wide range of the highest quality services, professional staff and individual approach to every customer – all these factors keep InstaForex on top and bring it new awards every year. 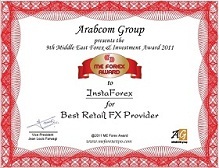 InstaForex was honoured with the prestigious Best Retail FX Provider Award 2011 at the financial exhibition organized by Arabcom Group. The exhibition was held in Dubai on November 15-16, 2011. 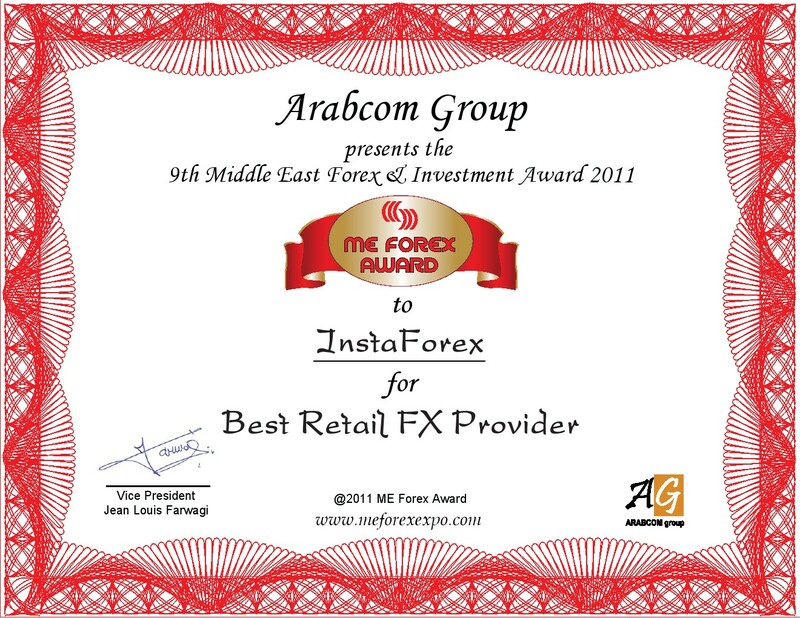 Arabcom Group, an organizer of large-scale exhibitions in the Gulf countries, awarded InstaForex the Best Retail FX Provider title in 2011. It is another top award that proves the professionalism of the company’s employees and the service quality. The success of InstaForex is ensured by willingness to meet the needs of each customer and partner. Individual approach and a wide range of brokerage services give every trader an opportunity to choose the most convenient trading tools and help to develop his own Forex trading strategy. The service of international level allows the company to hold the leading position on the international currency market for many years. More than 500,000 Forex traders have already chosen InstaForex. The prestigious awards show how high the customers and experts from all over the world assess the company.